Accurate colours; simple correction for kit decals; excellent donor kit. A must have for anyone planning to build Dragon's otherwise excellent new Meteor F.3 in 1/72 scale. 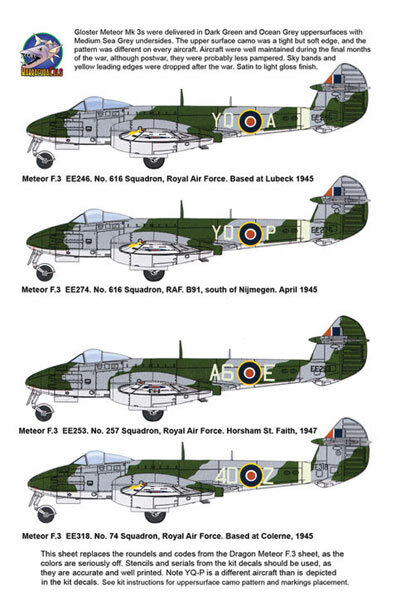 As some of you may have already noted in Glen Porter's recent review of Dragon's otherwise excellent brand new Gloster Meteor F.3, the colours of the roundels and codes on the kit decals are incorrect. 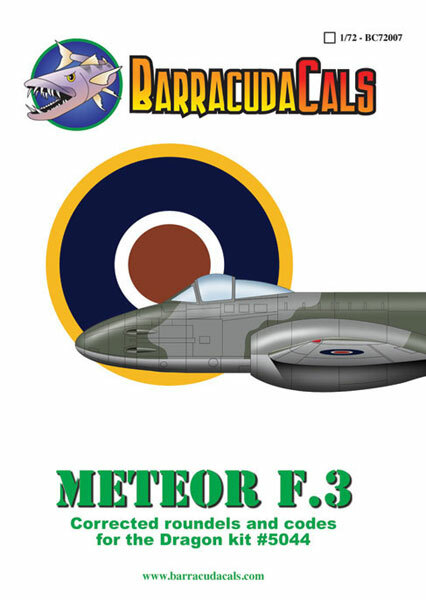 Barracudacals has created a simple and inexpensive solution to this problem with their new release, the entirely accurately named "Meteor F.3 Corrected Roundels and Codes". As the title implies, a full set of roundels and all the code letters are provided on the sheet. All colours are a major improvement on the kit decals, especially the Dull Red and Yellow of the roundels, and the Sky codes. The kit serials are good, so these are not supplied on the Barracudacals sheet. The decals are thin and printed in perfect register by Cartograf. This is a must-have correction for anyone building Dragon's 1/72 scale Gloster Meteor F.3.